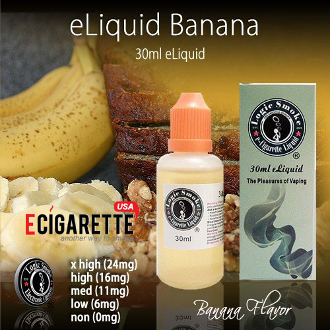 Logic Smoke Banana e liquid juice will take you back to childhood with its delicious, candy-like, tree-ripened flavor of bananas. There’s no mistaking this flavor! Attain even more satisfying flavors by combining it with alternative Logic Smoke flavors like cheesecake and chocolate for a tasty desert treat. The possibilities are plentiful! The 30ml bottle is a convenient and economical size for purchasing in quantity. Fill your clearomizer or other e-liquid atomizing device directly from the bottle or use it to refill your smaller travel-size e liquid juice bottles. You'll be ready and have liquid on-the-go at any time.